2016 is a big year for SharePoint. Microsoft released SharePoint 2016 and is discontinuing support for SharePoint 2007. If your staff uses an older or outdated version of SharePoint, now is the time to migrate or upgrade to a newer version. 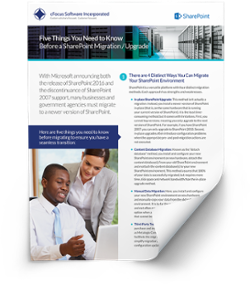 While a SharePoint migration can seem overwhelming, using a newer version will result in greater efficiency and overall cost savings for your organization. Click here to download the tip sheet!